As part of our urban climate study, we have maintained a network of 150 temperature and humidity sensors around the Madison area since 2012. The sensors collect readings every 15 minutes, giving us a database of over ten million measurements (so far), which enables us to understand Madison’s climate better than that of any city in the world. When we tell people about our study, one of the most common questions is what effects do the lakes have. Do they cool air temperatures during the summer, and by how much? We had the same questions. 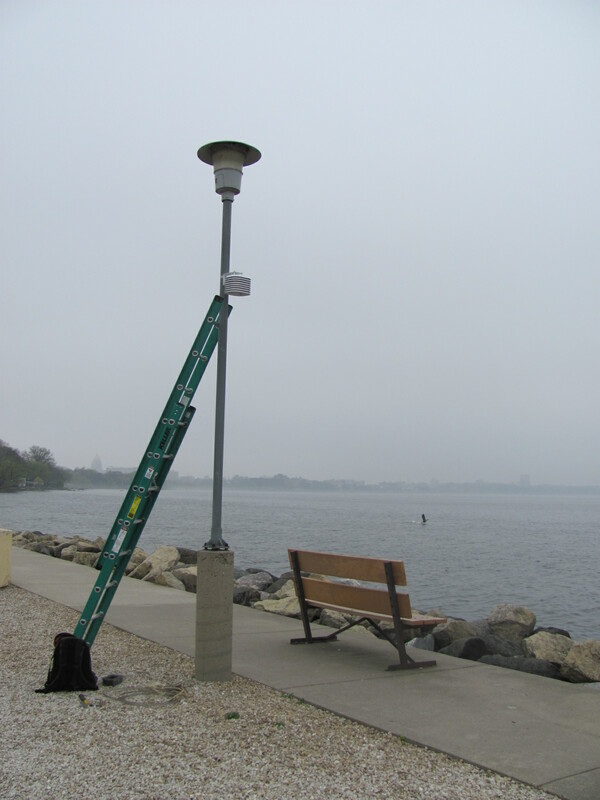 To answer them, we put sensors within a few feet of the shores of Lake Mendota, the largest of the Yahara lakes, at several locations: Picnic Point, Kennedy Park, Tenney Park, Warner Park, and various neighborhoods. These sensors show us the biggest effects the lake has on land temperatures. We also placed sensors at various distances from the lakeshore to understand how far inland these effects stretch. The short answer of what we found is it depends on how close to shore you are standing. Shoreline locations experience very typical lake effects, with warmer temperatures at night and cooler temperatures during the day, except in the fall. But the further you get from shore, the lesser the effects. The Yahara lakes just aren’t big enough. 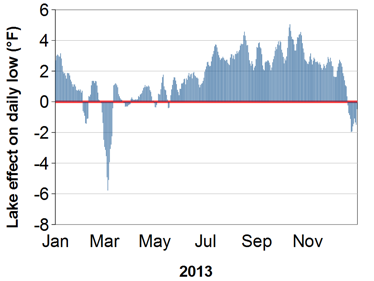 The graph below shows weekly average lake effects on daily high temperatures at the lakeshore locations throughout 2013. The lakes were frozen from mid-January through early April. While frozen, the lakes have little effect on shoreline temperature, because the ice covering the lake has the same temperature as the land surface: freezing. 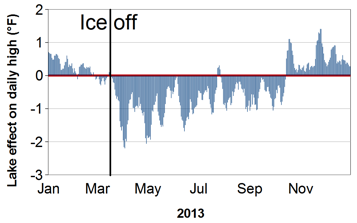 But after the ice melted, the lakes had a distinct cooling effect on shoreline temperatures. Since the water retained its cold winter temperatures, it lowered daily high temperatures along the lakeshore by an average of 1-2°F, with more cooling on hotter days, when the difference between water temperature and air temperature were greatest. This effect tapered off through the summer as the lakes warmed and the difference between water and air temperatures lessened. Again, these are weekly averages, which helps to smooth out data and make patterns more obvious, but we did find occasional individual days when the lakes cooled shoreline high temperatures by 4°F or more during the summer. In fall, when air temperatures begin to drop but the lakes retain their warm summer temperatures, the lakes actually raised daily maximum temperatures by a degree or so. As for low temperature effects, lakeshore locations experienced warmer nighttime low temperatures nearly every night. Lake temperatures are nearly always higher than the lowest air temperatures at night, except on occasional unseasonably cold days, because water retains heat better than air. This effect increased throughout the summer as the water temperature warmed, peaking at around 4°F in late summer and fall. How far inland are lake effects felt? Importantly, the effects shown above are for shoreline locations. So if you were standing directly on the lakeshore, these would be the average effects you’d feel. But how far inland do these effects extend? Do they cool just the lakeshores or the entire downtown? Based on our preliminary analyses, the lake effect tapers off very quickly as you travel inland. 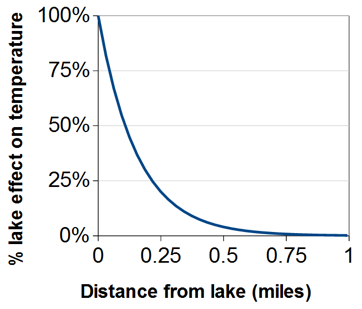 The graph below shows a typical relationship between the distance from the shoreline and the lake effect. The lake effect tapers off quickly the further from shore you get. For instance, if a certain day had a lake effect of 2°F, within a quarter mile of the shore that effect would quickly drop to just 0.4°F. Within half a mile, the effect would drop to about 0.2°F. You can try this experiment yourself. Next spring, after the ice melts, stand on the lakeshore and walk inland. You’ll find that it feels quite cool next to the lake, but once you get a block or so inland, the effect pretty much disappears. Larger water bodies, such as Lake Michigan, have a bigger effect. But Lake Michigan also has nearly 10,000-times the volume of Lake Mendota. These are very preliminary results, but they appear to be pretty consistent. Greater effects can certainly occur under certain conditions. For example, on a hot spring day with cold water temperatures, warm air temperatures, and strong winds, the lake effect could stretch considerably farther inland. But on average, Madison’s lakes primarily influence air temperatures close to the shore. This entry was posted in urban heat island and tagged Jason Schatz, Lake Mendota, Madison lakes, urban climate, urban heat island. Bookmark the permalink.